In 1995 the federally-managed commercial longline fisheries for Pacific halibut (Hippoglossus stenolepis) and sablefish (Anoplopoma fimbria) in the U.S. North Pacific moved from open-access management with limits on the Total Allowable Catch (TAC), to management systems with individual fishing quotas (IFQs). At that time, the halibut fisheries had the greatest number of participants of any fishery managed with individual quotas. This is the first of two papers that examine the IFQ system in the U.S. North Pacific halibut and sablefish fisheries. This paper discusses the circumstances leading up to the IFQ programme, the development of the IFQ programme, and the initial allocation of interests in the fisheries under the programme. The second paper (Hartley and Fina 2001) provides a more quantitative examination of effects of the IFQ programme, including participation levels, fleet consolidation, and other changes that have resulted from the programmes. The transition from open-access to IFQs was a long, arduous process marked by periods of progress, followed by periods of retreat, eventually leading to approval and implementation of an effective programme. As one might expect, the division of interests in a fishery after several years of open-access management is highly controversial. To develop an understanding of the subtleties of the IFQ programme, it is necessary follow a path similar to the path of the IFQ policymakers - taking several steps forward, then stepping back for a fresh perspective. The complexities of the open-access and IFQ management regimes and the, at times, conflicting goals and objectives of the involved policymakers complicate the task of describing programme processes and results. To aid readers in keeping important contextual information in mind as new concepts or data are introduced, this document is repetitive at times. Alaska halibut and sablefish fisheries are regulated by similar IFQ programmes that were developed by a single process. The fisheries differ both historically and in the manner of prosecution but, in general, have a high degree of similarity. This section describes the two fisheries before IFQ programme implementation. Halibut are fished exclusively with hook-and-line gear.1 Because halibut can be harvested in waters as shallow as 90 feet, the fishery can generally be prosecuted close to shore in small boats, including skiffs. Before settlement of the Pacific Northwest by Europeans, Native Americans fished for halibut with large canoes using hook-and-line methods (IPHC 1987). The Pacific halibut fishery developed into a commercial fishery in Washington and British Columbia in the 1880s by fishers who fished from dories, which were transported by larger vessels to and from halibut fishing grounds. In the 1920s, the fishery changed substantially with the introduction of diesel-powered vessels and mechanical longline gear and expanded to the Gulf of Alaska. Stock declines in the 1920s prompted the first regulation of harvests, a three- month closing intended to protect spawning. Regulation was instituted by the Halibut Convention of 1923 between the U.S. and Canada, the same convention that established the International Fisheries Commission, the predecessor to the IPHC, which currently provides biological management of the Pacific halibut fishery (IPHC 1987). As early as the 1930s, the fishery was developing as a part-time fishery and a substitute fishery for vessels that participated in other fisheries. Vessels with trawls and purse seines were adapted to fish halibut with longlines. During the 1930s and 1940s, several small salmon trollers and gillnetters entered the fishery, targeting halibut during slow salmon seasons. By the 1960s, halibut stocks were thought to be in decline, prompting the IPHC to lower catch limits. In the 1970s, increases in the price of halibut, together with implementation of limited entry programmes in the salmon fisheries, stimulated greater entry of small vessels to the halibut fishery. During the 1980s, the fishery experienced an influx of many larger vessels from crab fisheries as crab stocks declined (IPHC 1987). The obvious implication from this history is that, for much of its existence, the commercial Pacific halibut fishery has been a supplemental fishery, attracting vessels from other fisheries during slow seasons or periods of stock declines. The attractiveness of the fishery as a supplemental fishery is enhanced by the relatively small amount of specialized gear required for entry and the innate vulnerability of the species to capture. Over the second half of the 20th century, increasing numbers of vessels participating in the halibut fishery necessitated shorter and shorter seasons, even in periods when the TAC of halibut remained steady or increased. Short seasons for halibut limited fishers' ability to target halibut full-time. By the time that the individual fishery quota (IFQ) programme was instituted, the season in many regulatory areas had been reduced to 24-hour periods (Pautzke and Oliver 1997). The inability of halibut fishers to earn their total income from the halibut fishery is reflected in catch statistics from the fishery. Between 1984 and 1990, an average of 3275 unique vessel owners participated, and an average of 70% of all vessel owners who made landings of halibut also made landings of other species. During the same years, less than 25% of the total revenue earned by vessel owners with halibut landings was attributed to halibut. Traditional measures of fishing capacity can be inappropriate when applied to a supplemental fishery. Before IFQs, the halibut TAC would have been harvested in a matter of days. This should not be taken to indicate overcapacity in the halibut fishery because most of the fleet resources employed were also used in other fisheries when not targeting halibut. The sablefish fishery tends to be farther offshore than the halibut fishery. Sablefish typically are caught in waters 400 to 1000m deep, on the slope of the continental shelf or in areas with deep underwater canyons. Sablefish are harvested with longlines, pots and trawls.2 Because the fishery is prosecuted in deeper waters, often farther offshore, relatively large boats are needed, and therefore competition was, and is, less intense in the sablefish fishery than in the halibut fishery (Pautzke and Oliver 1997).3 Figure 2 shows the regulatory areas for sablefish in the Alaskan Canadian Region. Examining the activity of sablefish fishers in other fisheries demonstrates the reliance of sablefish fishers on other fisheries. From 1985 to 1990, at least 95% of vessels with sablefish landings had commercial landings of other species and, on average, generated 65% of their income from these other fisheries. While data indicate that the typical sablefish fisher relied more heavily on sablefish than the typical halibut fisher relied on halibut, sablefish fishers were clearly active in other fisheries. The composition of the sablefish fleet was also somewhat different from the halibut fleet, with sablefish vessels tending to be larger on average than halibut vessels. 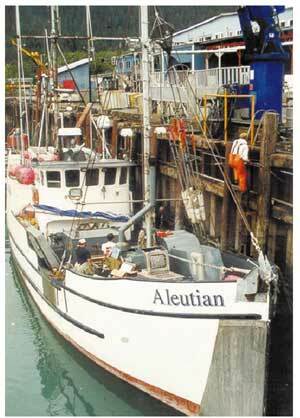 During the years from 1985 to 1990, the number of active sablefish vessels increased from 371 to more than 800. Between 1985 and 1990, an average of more than 20% of the sablefish fleet consisted of catcher vessels greater than 60 feet in length, compared to an average of 5% in the halibut fleet. In addition, an average of 2.5% of the sablefish fleet consisted of freezer vessels. During the same years, catcher vessels greater than 60 feet in length and freezer vessels harvested a combined average of 53% of the total sablefish harvest, compared to 28.5% for classes in halibut. In 1976 the Fishery Conservation and Management Act (now known as the Magnuson-Stevens Fishery Conservation Act) established the current management regime for fisheries in U.S. EEZ waters (waters between 3 and 200nm of the coast). The regime described in the Act called for creation of the North Pacific Fisheries Management Council (NPFMC)5 which has the mandate to make management recommendations to the U.S. Secretary of Commerce. Measures approved by the Secretary become binding regulations that are implemented by the National Marine Fisheries Service (NMFS).6 Management of sablefish and halibut fixed-gear fisheries in EEZ waters is conducted by this regime.7 While both fisheries are managed by NMFS and NPFMC, halibut TACs are determined by the IPHC, a commission created by a treaty between the U.S. and Canada to coordinate regulation of the North American Pacific halibut fishery (Pautzke and Oliver 1997). Before 1995, when IFQ8 systems in the fixed-gear halibut and sablefish fisheries off Alaska were instituted, both fisheries were subject to a common-property regime in which the total catch was controlled using TAC limits and seasonal limitations. Vessel registration and fishing permits, the only requirements to participate in the fisheries, were not limited and were available for nominal fees. Consequently, entry was essentially cost-free to fishers equipped and active in other fisheries. To better manage harvests and avoid local depletion, both fisheries are separated into regulatory areas. The boundaries of the regulatory areas differ for the two species. TACs were set for each species in each respective regulatory area. Under this management arrangement, both fisheries were fished intensively, and the fishing seasons became progressively shorter (Pautzke and Oliver 1997). As early as the 1950s, participation and effort in the halibut fishery had reached levels that required abbreviated seasons in some areas. In the Gulf of Alaska (GOA), the halibut season lasted less than 2 months; in Southeast Alaska, it lasted less than 1 month (IPHC 1987). Short season lengths notwithstanding, both fisheries drew progressively greater numbers of fishers. This trend was aided by the timing of seasons, which were scheduled to limit conflict with seasons for other species, thus minimizing the opportunity cost of entering the fisheries (NPFMC 1989). For the halibut fishery, IPHC managers set TACs and season opening dates for each regulatory area. Before the influx of effort in the early 1980s, the IPHC would monitor catch within the season and close the fishery when it appeared likely that the TAC would be harvested. As effort increased, managers found that they were unable to adequately monitor in-season catches - the harvest would exceed TACs before the catch could be counted. In an attempt to reduce the chance of overharvest of the TAC in an area, multiple seasons with fixed opening and closing dates were scheduled. Later seasons were conditional on remaining allowable catch. By the late 1980s - with several thousands of vessels participating each year - the first opening in some areas would last only 24 hours! Later openings (if uncaught quota remained) might be shorter or might be regulated with individual trip limits. Because sablefish are targeted primarily in deeper waters, the extension of EEZ waters in 1976 first brought the fishery under U.S. government management. The U.S. fleet's interest in the fishery grew enormously thereafter, particularly in the mid-1980s. As happened in the halibut fishery earlier, season-lengths shortened dramatically. In 1990, the season in the Eastern Gulf of Alaska was limited to 20 days, having been 180 days only six years earlier. The 1990 season in the Central Gulf of Alaska was limited to 60 days, having been 254 days six years earlier! (Pautzke and Oliver 1997). In the sablefish fishery, managers at NMFS set a season-opening date in the spring that was common to most regulatory areas in the GOA. Managers then monitored the catch as it progressed and closed each area as the TAC was harvested. Seasons were shortest where effort was highest. Seasons in Southeast and Southcentral Alaska might last only one or two weeks before the TAC was taken, while in the Aleutian Islands (characterized by sparse populations and relatively dangerous fishing conditions), seasons might last much of the rest of the year. Fishing effort generally flowed in a westerly direction from more populous and sheltered areas in Southeastern Alaska toward less populous areas where sablefish were found in increasingly open seas. Owners of larger vessels often would begin the year fishing in the Southeast when the season opened and fish there until the TAC was taken. They would then move westward into the Central Gulf until that fishery closed. This progression would continue westward into the Western Gulf and finally into the Aleutians and the Bering Sea. Owners of smaller vessels (more likely to be residents of Alaska) would more typically start the year fishing in the areas nearest their residences until those areas closed. Larger vessels would move to other areas to fish sablefish; smaller vessels would generally begin to prepare for summer salmon fisheries. Regulation by TAC and season limitations had several shortcomings. Safety was often compromised by fishers who would fish the short (sometimes single-day) season regardless of weather. This problem was especially prominent in the halibut fishery in which many fishers use small vessels, including skiffs (NMFS 1994). TAC management was imprecise. In the halibut fishery, seasonal limitations proved to be a crude tool for achieving a prescribed TAC. In short seasons, particularly those with only a single-day opening which became characteristic in the halibut fishery, over-harvesting (or under-harvesting) could not be predicted, because individual fishers generally were permitted unlimited catch during the season. The fisheries had excess fishing capacity in the sense that the total TAC could be harvested faster than the management agency could monitor the catch (NMFS 1994). Further, as fishers entered fisheries and seasons were shortened, fishers overequipped their vessels with redundant gear to limit downtime. 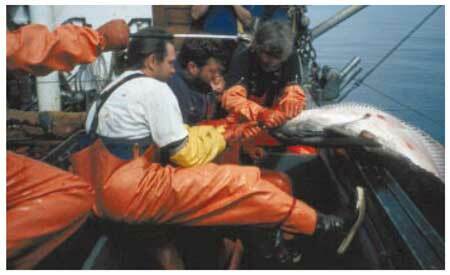 By 1990, an estimated $3 million worth of gear was redundant in the halibut fishery (NPFMC 1992b). Gear losses were excessive. To maximize catch in the single-day season, fishers typically would set more lines than they could retrieve in the allowable time. Maximum revenues were realized by fishers who always had a line to haul. At the end of the fishing period, fishers were prohibited from retrieving any additional gear, so they would simply abandon all lines they had not retrieved.9 Gear losses were estimated to be up to 25% of the gear set in some seasons (NPFMC 1992b). Over-harvesting was compounded by losses resulting from abandoned gear. Abandoned gear contributed substantially to population declines because its contribution to fishing mortality was more persistent than retrieved gear and might go through multiple cycles, as the first-caught fish would become bait for later catch. In 1990 and 1991, `deadloss' was estimated at 2 million pounds and 2.5 million pounds, respectively. The ex-vessel value 10 of the lost catch was estimated to be between $2.4 million and $4 million per year (NPFMC 1992b). Higher-value fresh fish would be available only for a brief time after the short season. Most of the fish caught during short seasons was frozen for later use. Quality also suffered as the rush to maximize catch in the short season led to poor handling and storage of some catch (NMFS 1994). These problems were generally much more severe in the halibut fishery than in the sablefish fishery. Participants and managers of the sablefish fishery, however, could see that trends from the halibut fishery were developing in the sablefish fishery. This was particularly true in Southeastern Alaska where a greater coastal population had better access to sablefish because of the relatively sheltered waters in that area. The IFQ programme was developed to address these problems. Industry and fishery managers alike recognized the need for a change. The process of change proved to be long and controversial. In the 1995 fishing season, after several years of in-depth social and economic analysis, discussion, negotiation, public meetings, comment periods, regulatory development, and implementation processes, the IFQ programme was instituted in the halibut and sablefish fisheries. Development of IFQ programmes for sablefish and halibut cannot be separated. Throughout the process, attention and programme development shifted between the two fisheries with changes in political pressures. Problems developed first in the halibut fishery. In the late 1970s, NPFMC began considering limited entry options to protect the halibut fishery. By 1983 the severity of the threat to the fishery compelled the NPFMC to recommend a moratorium on entry. The moratorium, however, was not approved by the Secretary of Commerce, who favored a more thorough limited-entry programme (Pautzke and Oliver 1997). This rejection of the moratorium slowed development of management strategies for the halibut fishery, and the NPFMC's efforts to develop a new management regime for halibut waned. Development of the sablefish fishery lagged slightly behind that of the halibut fishery. Yet, as momentum to develop new management procedures for halibut declined, similar management issues arose in the smaller sablefish fishery. In the mid-1980s, the NPFMC decided to focus on programme development in the sablefish fishery. By 1987 the short, intense seasons and gear conflicts in the sablefish fishery had begun to resemble those of the halibut fishery (NMFS 1995, Pautzke and Oliver 1997). In the same year, the NPFMC adopted a commitment to develop and analyze licence limitation and transferable quota systems for sablefish management. By 1988 workshops were held to obtain further input from the industry and public on management alternatives. In early 1988 the NPFMC directed its staff to develop and evaluate various different management regimes for the sablefish fishery, including continued open-access, licence limitations, the IFQ system, and hybrids that intertwined these three different management systems. The environmental impact statement developed in pursuance of the resolution for the sablefish fishery was revised to include an IFQ management scheme and was distributed for public review in May 1991 (NMFS 1994). Because many fishers had been active in both halibut and sablefish fisheries, the NPFMC decided to use the sablefish IFQ programme as a prototype for developing a similar programme in the larger halibut fishery. It was believed that simultaneous implementation would decrease obstacles and reduce resistance to the programme in the halibut fishery. In 1991, an environmental impact statement incorporating an IFQ programme was also developed for halibut, bringing management development for the two fisheries to an even plane (NMFS 1995). In September 1991, the NPFMC provisionally recommended IFQ management for both the sablefish and halibut fisheries. After an additional round of analysis and public comment the final recommendation of NPFMC was issued late in 1992 and approved by the Secretary of Commerce in January 1993. Applications for initial allocations were collected and processed in 1994. Fishing under the IFQ management system began with the opening of the 1995 season in March of that year (NMFS 1995). The NPFMC and the NMFS had developed the IFQ programme over the course of more than 15 years. They had held numerous public meetings and considered several alternative management regimes and several different types of allocation schemes before the IFQ programmes were approved and finally implemented in 1995. The IFQ system substantially changed rights in the fisheries. At the commencement of the programme, the NMFS issued quota shares (QS) to fishers for each regulatory area of each fishery. At the beginning of each season, the TAC for each regulatory area of each fishery is determined.11 The holder of quota shares is entitled to a portion of the annual TAC in the applicable regulatory area. This annual allotment is referred to as the fisher's IFQ and is the weight12 of the fisher's permitted catch for the year. The amount of IFQs is equal to the area TAC multiplied by the fisher's quota shares, divided by the total quota shares issued in the area (the quota share pool). IFQs may be fished at any time during open season. Under the IFQ programme, an extended season, which begins March 15 and ends November 15, was established. Unused IFQ cannot be retained for use in a future year. On the other hand, recognizing that unintentional overages can occur, over-harvests of up to 10% of a fisher's IFQ are addressed by a reduction in the following year's IFQ without penalty. Fishers with `overages' in excess of 10% are subject to enforcement sanctions, including confiscation of harvests (NMFS 1995). Holders of quota shares may sell their rights13 . Several restrictions on the sale of quota shares were adopted to avoid excessive consolidation and other changes in the character of the fishing fleet. Although the system creates a property right in the fishery, to avoid costly litigation in the event that the management programme is changed, the programme does not create a permanent interest in the fishery. Quota shares remain valid indefinitely; however, if the programme is discontinued, the quota shares holders will not be entitled to compensation (NMFS 1995). Fundamental to an IFQ programme is the initial issuance of quota shares in the fishery. Fishers who have issued quota shares receive a right to harvest a predetermined fraction of the TAC. This initial allocation influences both the distribution of wealth among fishers and the character of the fishery. The importance of the initial allocation did increase because of restrictions on transferability of quota shares. This section examines policy objectives of the initial allocation and the method by which the allocation was determined. to discourage speculative entry into the fishery. The initial allocation recommended by the NPFMC embodied these objectives, specifically the overriding theme of preserving the size and character of the fleet (NMFS 1994). Rewarding current participants with quota shares served this objective. By 1990 it was apparent that, in the future, entry to the fishery would need to be limited in some manner. Consequently, the NPFMC decided that activity after 1990 would not be used in determining the initial allocation of quota shares to prevent fishers from entering the fishery simply to obtain quota shares, in essence, gaining a property right in the fishery (NMFS 1995, Pautzke and Oliver 1997). At the time of programme development, the Magnuson-Stevens Act prohibited any charge on issuance of quota shares. The absence of a charge had the added effects of helping to meet the objective of preserving fleet character and avoiding opposition to the programme. Requiring payment for the initial allocation might have excluded some traditional participants from the fleet simply because of their inability to afford quota shares. Sale of the initial allocation might have allowed corporations, banks, or owners of large industrial vessels, to purchase a large part of the initial allocation. Not charging for quota shares, however, created potential windfalls profits to quota recipients. An ancillary goal of the broad-based initial allocation was to allow fishers to determine the extent of their activity in the fishery. Fishers could choose to exit the fishery by selling quota shares, increase activity in the fishery by purchasing additional quota shares or IFQs, or simply fish their initial allocations. With a broad-based allocation of initial shares, market conditions would be more likely to determine activity in the fishery. One limiting factor in the initial allocation was that only vessel owners and fishers leasing vessels were allocated quota shares. Crews were not granted shares (NMFS 1994). The objective of this rule was to reward boat owners, who had invested in the fisheries. Operators who could demonstrate a leasehold interest in vessels were also thought to have invested sufficiently in the fishery to entitle them to quota shares.15 Omitting crewmembers from the initial allocation also made the process workable. Further, unlike the case for data for vessels and vessel owners, no official data were available to verify past participation of crewmembers in the fishery. A few adjustments were made to quota shares allocations in determining the final issuance. In regulatory areas in the Aleutian Islands and Bering Sea, the allocations were reduced to develop a Community Development Quota (CDQ) programme. The CDQ programme was designed to assist area communities by allocating them portions of the TAC. Historically, these communities have reaped little reward from the fisheries because of a lack of economic capital. By allocating portions of the TAC to the communities, it was hoped that they would become active participants in the fisheries. Fishers who had been denied quota shares to accommodate the CDQ programme were granted a proportional amount of quota shares in regulatory areas that did not have CDQ programmes, and there were proportional decreases in the quota shares of all other fishers in those areas (NMFS 1994). While a major policy objective in the initial issuance was to reward active fishers, the NPFMC also sought to minimize complaints. This goal was pursued by using a cost-free, broad-based system for issuing quota shares and by developing the initial allocation rules through a public process. The initial allocation of quota shares was based on the historical activity in the fisheries. Vessel owners16 with any landings of halibut or sablefish in 1988, 1989 or 1990 were eligible to receive quota shares for the applicable fishery. For halibut, one quota share was issued for each pound of halibut landings in the fisher's best five of the seven years from 1984 to 1990 inclusive. Similarly, for sablefish, a fisher's quota share allocation equaled the fisher's total pounds of sablefish landings in the best five of the six years from 1985 to 1990 inclusive. The decision to use multiple years to determine eligibility and quota shares allotments was made to accommodate fishers who had been unable to fish for one or more years because of unexpected circumstances, such as illness or the Exxon Valdez oil spill.17 Because quota shares entitle the holder to a portion of the annual TAC, the system allows annual management of total harvest levels without re-issuing quota shares (NMFS 1994, NMFS 1995). Once the policy decisions had been made, the job of implementing the programme (including the initial allocation) was turned over to the NMFS. The NMFS developed a separate division, the Restricted Access Management (RAM) Division, to administer the programme, including the initial allocation. At onset, this RAM office staff comprised nine persons, two transferred from other divisions of the NMFS, and seven newly hired. The office was understaffed during initial allocation and has since grown to 18 persons. The growth is attributable to fulfillment of staff requirements, expansion of duties outside the IFQ programme, and replacement of contract consultants with in-house employees. Currently, IFQ programme management comprises 80% of RAM duties (Gharrett 2000). Substantial funding was required at the outset - an estimated $2 million was spent initiating the IFQ programme. Changes as the programme was developed required significant expenditures in the first few years, but in the past few years, spending has leveled. The budget for the RAM office in fiscal year 2000, $1.1 million for IFQ programmes, is a reasonable estimate of yearly administration costs (Gharrett 2000). An additional $2.3 million is spent on enforcement of the IFQ each year, or approximately 1.8% of the total ex-vessel value (Smith 2001). In general, the quality of catch data was good. Ownership data were less complete and less accurate because owners were under no obligation to report many of the details of vessel ownership or vessel lease interests.21 Although this was time-consuming, data organization for determining quota shares allocations did not pose substantive problems. Beginning in the late 1980s, the NPFMC staff organized the data for the halibut and sablefish fisheries to analyze different management alternatives. Once the decision to proceed with the system had been approved by the Secretary of Commerce in January 1993, the NMFS began to finalize data for the initial allocation. By January 1994, slightly less than one year later, the NMFS had produced preliminary estimates of initial allocations for all fishers. Once the data had been fully organized, the NMFS prepared individual applications for each vessel owner qualified to receive quota shares. The preprinted applications, which included a report of relevant catch and ownership data, were mailed to each qualified vessel owner. Those who did not receive an application by a certain date, but who thought they were entitled to initial quota shares, were asked to call the NMFS to request an application. The development of the programme and its progress toward implementation were public knowledge as they were reported by both trade journals and the popular press. Because fishers were involved in the process from the onset, few if any, failed to obtain quota shares because of lack of knowledge of the need to apply. The NMFS required vessel owners to verify the data in the applications and to submit the applications within a 6-month period that began 17 January and ended 15 July 1994. Owners were entitled to correct or dispute existing records, if needed. The NMFS reviewed each returned application for any data discrepancies. Applications returned without change were forwarded to the NMFS technical reviewers. If an application was corrected or disputed by the vessel owner, the NMFS requested documentation supporting the change, such as fish tickets, leases or ownership documentation. The owner was required to resubmit the application with supporting documentation within 90 days. On receipt of the application and supporting documentation, the application materials were passed on for technical review (NMFS 1994). Within 45 days of receipt of the application (and supporting documentation when applicable) the NMFS technical reviewers were required to process the application and notify the vessel owner of the quota shares entitlement.22 This completed the technical review process and issuance of quota shares began in November 1994. Any vessel owner who disagreed with the quota shares determination of the technical review could file an appeal (NMFS 1994). Approximately 9000 applications for quota shares were filed. Of those applications, approximately 1100 were determined to be ineligible. An additional 650 applicants disputed the allocation as determined by the NMFS data. Table 1 shows the reasons and number of appeals to the NMFS initial allocation determinations. Only 179 applicants - fewer than 3% of all applicants - appealed the decision made in the technical review. More than half of the appeals challenged determinations of eligibility for quota shares or challenged vessel ownership or lease interest conflicts. Only 10 cases among the appeals heard by the NMFS have been subsequently appealed to the federal court system (NMFS 2000a). Fishing under the programme began in March 1995, when the new season began. Thus in a 28-month period, from November 1993, when the final rules were published, to March 1995, the initial allocation was decided (with the exception of pending appeals), and fishing under the programme began. The initial allocation process by itself cannot assure that the goals of any trading programme are met because many of the goals pertain to the operation of the fishery after that allocation. Transfers of IFQs and quota shares after the initial allocation can drastically alter the distribution of interests, erasing the success of a well-crafted initial allocation. An initial allocation, however, can either be an obstacle to achieving goals of the system or can set the stage for attaining those goals. The initial allocation in the halibut and sablefish IFQ programme generally laid a solid foundation toward success of the programme and achievement of programme goals. Two goals were substantially attained by the initial allocation. First, the initial allocation sought to maintain the character of the existing fleet. This goal included a strong desire to protect small fishers from being forced from the fishery by large fishing interests (NMFS 1994, NMFS 1995). The programme achieved this purpose in two ways. First, fishers were granted quota shares based on fishery participation over several years. This rule dispersed interests in the fishery among many more fishers than had participated in any single year. Second, no payment was required to receive quota shares under the programme. Although such payments were not legal at the time under the Magnuson Stevens Act, had they been required, larger vessels might have been able to exclude smaller vessels from the programme at its onset. A second goal was to disburse the windfall profits created by giving fishers quota shares free of charge. This was accomplished by considering fishing activity over several years, which brought more fishers into the programme. The NPFMC knew that the fleet would consolidate in time, but the goal was to let that consolidation occur through the market rather than in the initial allocation. With a widely-disbursed initial allocation, windfalls were minimized and the market was left to respond, with fishers deciding whether to remain in the fishery or leave (NPFMC 1992b). A third goal was pursued through a separate avenue. The NPFMC sought to develop a system for the benefit of the small communities in the Aleutian Islands and on the Bering Sea that have traditionally been unable to participate in the fisheries. The CDQ programme was developed for this purpose. In regulatory areas in the Aleutian Islands and the Bering Sea, between 20 and 100% of the quota shares was set aside for this programme. Fishers denied shares by the CDQ allocation were compensated with shares in other regulatory areas (NMFS 1994). CDQ shares are nontransferable, but the communities can hire fishers to fish their quota. Communities granted these shares have handled their shares in one of two ways. Some have sold the annual harvest rights to fishers, and although this approach is not what policymakers had initially hoped would happen, transfers of annual fishing rights for royalties have proven an effective source of income for some communities. Other communities have developed their own fishing sector and have benefited from both revenue created and jobs generated by the CDQ programme. At the time that the IFQ programme was implemented, many fishers were wary of its potential impacts on their fishing. After initial trepidation subsided, fishers in general seemed satisfied with the programme and its initial allocation process.26 The most satisfied were those fishers who were historically the most active in the longline fisheries. These fishers received the largest allocations because quota shares were issued in proportion to activity in the fishery. A few groups, however, were dissatisfied with the initial allocation: fishers who were given small quotas because of scant participation history, crewmembers, and fishers active between 1991 and 1994 but not in the qualifying years before 1991. A significant number of fishers who had limited history in the fisheries felt that their quota shares were not sufficient to support their continuing in the fishery. In a survey of sablefish quota shares holders, 20% expressed the opinion that their quota shares were insufficient to fish economically. Approximately 10% believed that their allocation was not fair (Knapp and Hull 1996a). As expected, these criticisms came mainly from quota share-holders who received small initial allocations. Most had participated in the fishery for only a year or two. Since a fisher's initial allocation was based on activity in the fishery over a five-year period, those participants whose initial allocations were supported by only one year's catch ended up with approximately 20% of a single year's catch. By using many years of activity to determine the initial allocation, the programme had the effect of diluting the shares so that shareholders with limited catch histories could not fish economically. Many such shareholders sold their quota shares and left the programme after the first few years. Fishers active between 1991 and 1994, but not before 1991, were excluded from receiving an initial allocation. These fishers represented a substantial part of both the halibut and sablefish fisheries in the years immediately before the IFQ system was initiated in 1995. More than 25% of the sablefish and more than 17% of the halibut (by weight) harvested in these years had been caught by fishers who received no initial allocation.28 The 1990 cutoff date was used to prevent fishers from entering the fishery simply to obtain a valuable interest in the fishery once it had been decided that entry would be limited in the future.29 Although these fishers were dissatisfied with the initial allocation, the overall response was that it was fair. Because allocation was based strictly on historical activity, fishers who received small initial allocations were deprived of the argument that they deserved an interest in the fishery over others. In addition, the transferability of quota shares allowed those who desired to increase their activity the right to purchase into the fishery to make up for the absence of an initial allocation. While doing so would be costly, the ability to increase one's interest in the fishery provided a remedy for those who desired to do so. The first two alternatives would have reduced the initial number of qualified vessel owners, thereby increasing the proportion of the annual harvest (IFQs) to which each qualifier would have been entitled. These two alternatives were rejected because they would have eliminated some vessel owners with a history of fishery participation, whilst the minimum standards and additional qualification criteria might have been seen as arbitrary. In addition, because anyone receiving an initial allocation would have the right to purchase or sell quota shares, the programme was thought to provide an option for any fishers who believed they had received an initial allocation that could not be fished economically. In the end, the initial allocation was designed as a broadly inclusive programme that provided an initial allocation to as many fishers as showed activity in the fishery in the past. The third and fourth alternatives might have reduced the number of fishers who received entitlements that were uneconomic to fish, but both represented a move away from allocation of quota shares based on actual catch history in the fishery. If the allocation had provided a minimum number of quota shares to all qualifiers regardless of catch (the third alternative), then the quota shares of qualifiers who had exceeded the minimum would have been diluted - an outcome that was politically unacceptable and raised questions of fairness. The fourth alternative also would have raised contentious issues of fairness. A vessel owner who landed only 100lb in a year would receive the same allocation as a vessel owner who landed 10 000lb in the same year. The initial allocation of shares of an IFQ programme cannot ensure the success of the programme. Trading of shares after the initial distribution can thwart efforts to achieve programme goals, despite the best-defined initial allocation. The initial allocation, however, can start a programme toward success by defining the character of the fishery for the first few years while the trading system develops, and by facilitating acceptance of the programme by fishers. The initial allocation of IFQs in the halibut and sablefish fisheries served several defined objectives. By distributing shares based on historical catch, the allocation preserved the character of the fleet. The broad distribution of shares limited the windfalls created by the distribution of shares at no cost. Although the quantity of shares received by a fisher was reduced, the broadly inclusive initial allocation had the effect of limiting the dissatisfaction of excluded fishers. Once active in the fishery, fishers could trade shares in the market to determine their level participation. By allocating shares only to vessel owners, the initial allocation rewarded those who had invested to participate in the fishery. Clearly, the initial allocation served these specific programme goals. Most fishers believed that the process by which the programme (and the initial allocation) were determined, fairly considered the opinions of all interests. Open meetings and comment periods ensured that all opinions were heard and evaluated. The initial allocation carefully defined programme goals, tailored the rules governing the initial allocation to achieve those goals, and strictly adhered to those rules. The process by which the programme was developed, and the well-defined rules for the initial allocation, created a foundation of support for the programme on which to build future success. The overall goal of the IFQ programme was to create a safe, productive, profitable fishery. This goal could not be accomplished without acceptance of the programme by its participants. The initial allocation developed the support for the programme necessary for its success. Alaska Commercial Fisheries Entry Commission 1999. Changes Under Alaska's Halibut IFQ Programme 1995 to 1998. Juneau, Alaska. November 1999. Gharrett, J. 2000. Data Operations Manager, National Marine Fisheries Service, Restricted Access Management Division. Personal communication with Northern Economics, Inc. 3 December 2000. IPHC - International Pacific Halibut Commission 1987. The Pacific Halibut: Biology, Fishery and Management. Seattle, Washington. Kingeter, J. 2000. Assistant Special Agent in Charge for IFQ Enforcement, Alaska; National Marine Fisheries Management Service. Pers. comm. with Northern Economics Inc., 3 December 2000. Knapp, G. and D. Hull 1996a. University of Alaska Anchorage, Institute for Social and Economic Research. The First Year of the Alaska IFQ Programme: A Survey of Sablefish Quota Share Holders. September 1996. Knapp, G., and D. Hull 1996b. University of Alaska Anchorage, Institute for Social and Economic Research. The First Year of the Alaska IFQ Programme: A Survey of Halibut and Sablefish Registered Buyers. September 1996. Lowe, S. 2001. NMFS Fishery Biologist. Personal communication with Northern Economics Inc., January 2001. Matthews, D. 1997. Beyond IFQ Implementation: A Study of Enforcement Issues in the Alaska Individual Fishing Quota Programme. Silver Spring, Maryland. April 1997. NMFS - National Marine Fisheries Service 1994. Restricted Access Management Division. The IFQ Programme, Insights and Updates. February 1994. NMFS 1995. Restricted Access Management Division. The IFQ Programme, Underway. February 1995. NMFS 2000a. Restricted Access Management Division. 2000 Report to the Fleet. July 2000. NMFS 2000b. Alaska Enforcement Division. Enforcement Report for the Period 10/1/2000 through 12/5/2000. Juneau, Alaska. December 2000. NMFS 2001. Restricted Access Management Division. Individual Fishing Quota (IFQ)/Community Development (CDQ) Halibut Programme Reports on the Internet at http://www.fakr.noaa.gov/ram/ ifqreports.htm. February 2001. NPFMC - North Pacific Fishery Management Council 1989 Draft Supplemental Environmental Impact Statement for Longline and Pot Gear Sablefish Management in the Gulf of Alaska and the Bering Sea/Aleutian Islands. November 16, 1989. NPFMC 1992a. Final Supplemental Environmental Impact Statement/ Environmental Impact Statement for the Individual Fishing Quota Management Alternative for Fixed Gear Sablefish and Halibut Fisheries. September 1992. NPFMC 1992b. True North. October 1992. NPFMC 1997. Draft Environmental Assessement/Regulatory Impact Review/ Initial Regulatory Flexibility Analysis for Proposed Regulatory Amendments to Implement Management Alternatives for the Guided Sport Fishery for Halibut off Alaska. April 1997. NPFMC 2000. Electronic data provided to Northern Economics Inc., by special request. November 2000. Pautzke, C.G. and C.W. Oliver 1997. North Pacific Fishery Management Council. Development of the Individual Fishing Quota Programme for Sablefish and Halibut Longline Fisheries off Alaska. Smith, P. 2001. NMFS Restricted Access Management Division Chief, Personal Communication with Northern Economics Inc., 27 February 2001. Tremaine, D. 2000. Former NPFMC Staff Economist and contributing Author to NPMFC 1992, Personal Communication with Northern Economics Inc., November 2000. 1 The halibut fishery is primarily a longline fishery, but other hook-and-line methods are used. 2 The trawl fishery is granted a portion of the sablefish TAC in the Aleutian Islands and the Bering Sea and are subject to separate regulation. The pot fishery is permitted only in the Aleutian Islands and the Bering Sea. The use of pots, however, is regulated by the fixed-gear management programme. 3 In Southeast Alaska, particularly in the Alexander Archipelago, deep canyons are found in well-protected areas which allow small vessels to participate in the sablefish fishery. In these areas, fishers with smaller vessels target sablefish for a short portion of the year to supplement their income from salmon and herring fisheries. 4 Vessels more than 60 feet in length are prohibited from fishing salmon, limiting alternative fisheries in which some of the large sablefish vessels are able to participate. 5 The NPFMC is composed of a panel of 11 voting members (six from Alaska, four from Washington, and one from Oregon) and four non-voting members. Voting members represent the fishing industry, fish processors, and federal, state and local agencies (Pautzke and Oliver 1997). 6 NMFS is an agency of the National Oceanic and Atmospheric Administration (NOAA) under the U.S. Department of Commerce. 7 Since its creation, NPFMC has had jurisdiction of sablefish. Halibut came under its jurisdiction only after the resolution of treaty issues with Canada in 1982. Halibut is managed jointly by NMFS and IPHC. In general, the IPHC is charged with monitoring stocks and setting overall catch limits. Allocation of catch limits within the three separate jurisdictions (Alaska, British Columbia, and the Pacific U.S.) is handled by the respective agencies responsible for management in those areas. In Alaska, NMFS and NPFMC determine catch allocations. These agencies were responsible for developing the IFQ programme. 8 The term "IFQ," as used in the Alaska sablefish and halibut fisheries, is generally analogous to the more broadly used term Individual Transferable Quotas (ITQ) - "fishing" was substituted for "transferable" because during the development of the programme, it was uncertain whether the individual quotas would actually be transferable. 9 Abandoned gear could be retrieved with permission from the regulatory agencies after the season ended and all fish were offloaded. Any fish remaining on the gear that was retrieved had to be discarded at sea. 10 Ex-vessel value is the value of landed, raw fish delivered by a fisher. 11 The sablefish TAC is determined by the NPFMC, subject to approval by the Secretary of Commerce. The halibut TAC is determined by the IPHC. 12 Halibut traditionally have been landed in a headed-and-gutted form. Halibut TACs and IFQs are set in terms of headed-and-gutted weight. Sablefish TACs and IFQs are set in terms of round weight (NMFS 1995). 13 The right to sell IFQs (properly considered a lease of quota shares) was initially limited and, after 1997, was prohibited for shares designated for use on catcher vessels. The lease of quota shares is allowed on freezer vessels (NMFS 1995). 14 Part of the rationale for considering several years was to avoid excluding from the fisheries fishers that typically participated but could not participate for a year or two due to illness or other uncontrollable circumstances (NMFS 1994, Pautzke and Oliver 1997). 15 Records such as licence purchase, tax records showing deductions of lease and crew payments, and other similar documents could be used to show that a vessel was being operated under a lease. 16 "Vessel owners" includes fishers operating a vessel under lease. Partners and corporations were also eligible for quota shares. Former owners of dissolved partnerships and corporations were entitled to quota shares proportional to their interest in the venture. 17 The decision to use multiple-year qualification criteria also eliminated the need to allow appeals based on hardships. Fishers that had been unable to participate for three consecutive years in the fishery were deemed not to be active participants. 18 At the onset of the programme, collection of fees from IFQ holders was not permitted by the Magnuson-Stevens Act. The fee collection programme was authorized by changes to the act by the U.S. Congress on 11 October 1996, after the IFQ programme had been implemented. 19 Actual data were usually collected by ADF&G and the IPHC and forwarded to the NMFS. 20 The greatest information shortcoming was the absence of good records related to leasehold interests. Other problems were related to divorced couples, deceased vessel owners and dissolved corporations and partnerships. 21 The vessel registration required to participate in the fisheries in Alaska did not (and still does not) require a full disclosure of all owners with an interest in the vessel, nor was there any requirement for leaseholders to report their use of a given vessel. The lack of detailed reporting on ownership meant that available data were too imprecise to support determination of allocations in all situations, particularly cases in which partial ownership levels changed over the relevant catch history period. 22 NMFS refers to this decision as an "Initial Administrative Determination". 23 Appeals were allowed only on questions of fact. Appeals claiming that hardships had prevented persons from participating were not allowed - a conscious decision of the NPFMC, which believed that it had provided for hardships by allowing persons to qualify if they had participated at all in 1988, 1989 or 1990. 24 The issuance of IFQs takes place every year on 31 January. Quota shares under appeal on 31 January generally are not included in the IFQ issuance for the year. 25 Minor changes to the quota shares pool have occurred as a result of enforcement actions (which may remove shares) and the settlement of appeals (which may increase shares). 26 In a survey of sablefish quota shares holders in the first year, 17% said the programme had "no positive effects." In the same survey, 23% said the programme had "no negative effects" (Knapp and Hull 1996a). 27 Partially to appease crewmembers who had not received an initial allocation, the system created a transfer preference for crewmembers who had been active in any U.S. commercial fishery for at least 150 days. 28 These entry rates were similar to entry rates in the years before 1991. 29 As with crew, these fishers would be permitted to buy quota shares to enter the fishery if they met the 150-day threshold. 30 One advantage of a system based exclusively on participation (rather than on catch) is that it is less data intensive. 31 In addition, fishers in Alaska have come to believe that historical catch will be used if and when IFQs or similar systems are enacted in other fisheries. This belief has had the unintended consequence of assigning value to catch history of vessels. Now when vessels are bought and sold, the catch history of a vessel is considered. Vessels with more historical catch garner higher prices than similar vessels with less catch history.